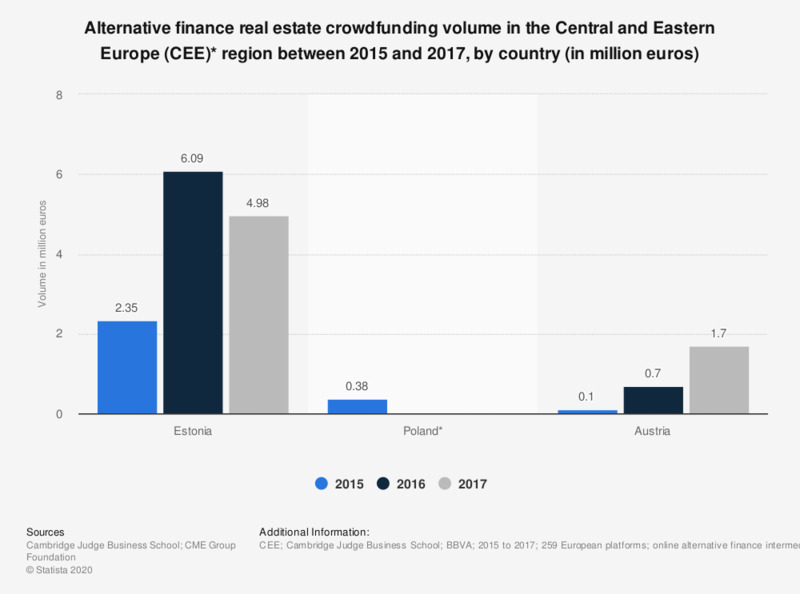 This statistic shows the alternative finance real estate crowdfunding volume in the Central and Eastern Europe region in 2015 and 2016, by country. It can be seen that the alternative finance volume attributable to real estate crowdfunding in Estonia totaled 6.1 million euros in 2016. *The Central and Eastern European online alternative finance market includes transaction volumes from the following countries: Albania, Armenia, Austria, Belarus, Bosnia & Herzegovina, Bulgaria, Croatia, Czech Republic, Estonia, Georgia, Hungary, Kosovo, Latvia, Lithuania, Macedonia, Moldova, Montenegro, Poland, Romania, Serbia, Slovakia, Slovenia and Ukraine. * Data not available for 2016.